It’s a cold and rainy Monday here in Boston so why not write about a great whisky that comes to mind on a day like today, Old Pulteney 21 year-old. The Old Pulteney distillery is located in Wick, Scotland and was first established in 1826. It is one of the most northerly mainland distilleries located in Scotland and the coastline atmosphere is very much a part of the identity of the distillery, as well as the whisky it puts out. For the maturing process of this 21 year-old, the whisky matured in ex-bourbon casks (second fill American Oak) is married with whisky matured in some ex-oloroso sherry casks (Spanish Oak first fill). This whisky is an exceptional whisky that is an absolute must try. I was lucky I was able to taste this single malt during the Go! 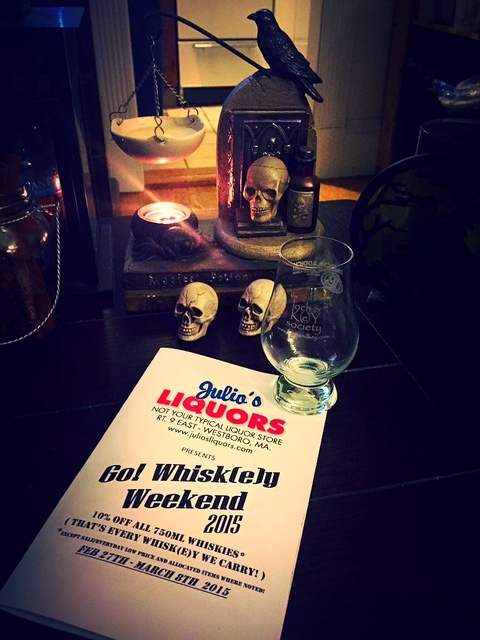 Whisk(e)y Weekend 2015 put out by Julio’s Liquors. To me, it is not surprise that this 21 year-old single malt won best whisky in Jim Murray’s 2012 Whisky Bible. The combining and blending of the two casks is done beautifully. It is smooth, creamy, balanced and tastes amazing. The average cost is around $140 and yes, I would absolutely pay that for this whisky. The quality and taste make up for all that, and a lot more. Agree all the way! Lovely and yes I´d pay that Money for it!